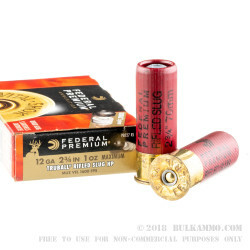 This 12 gauge rifled slug ammo from Federal is part of Federal's Vital Shok line and is the perfect choice if you are looking for ammo take take down that trophy buck. The reason why this round is so effective is because of Federal's patented TruBall rifled slug system. Each round features a plastic ball between the wad and the slug that keeps the slug centered in a smoothbore and increases accuracy. Federal claims that the round is capable of shooting 1.4-inch groups at 50 yards, which is performance that is typically only available with sabot slugs. 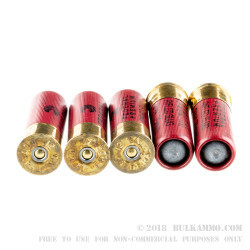 Each of these rounds features a 1 oz rifled hollow point slug loaded in a 2-3/4" shell. 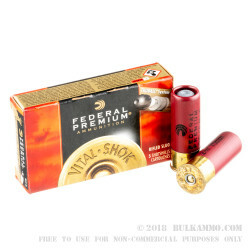 Pick up a 250 round case of this Federal ammo so you have some shells to practice with before you go out on a hunt! Q: what's the FPS on this? A: Those are moving at 1600fps according to the manufacturer. Q: What are the ballistic statistics for this round. A: Hello Robert! Thank you for reaching out to us about that Federal ammunition! According to Federal, the muzzle velocity of the Truball slug is 1600 fps.